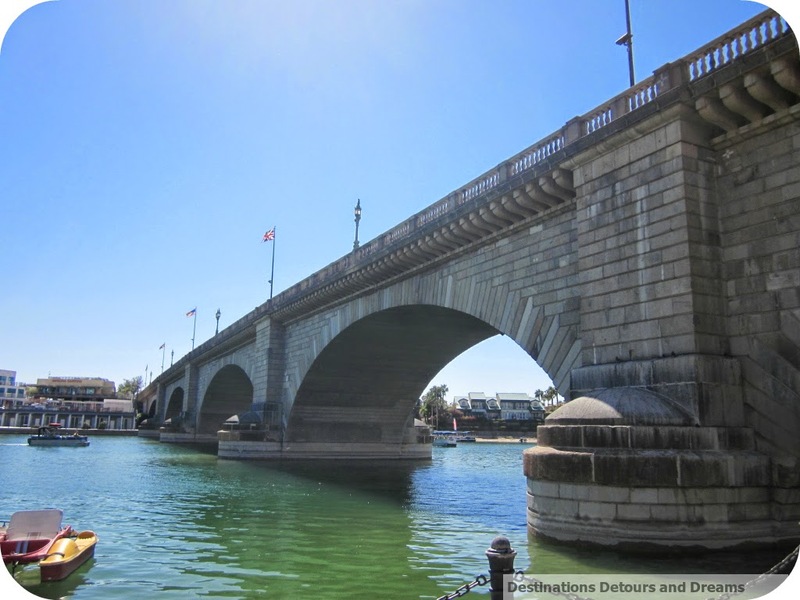 It seems odd to go to Arizona to see the London Bridge, but the bridge that spanned the Thames River in London, England between 1831 and 1968 is now in Lake Havasu City, Arizona. You may have sung the nursery rhyme “London Bridge is falling down” as a child. The bridge referred to in that song was built between 1176 and 1209 to replace an earlier timber bridge. The winning bid went to Lake Havasu City founder Robert P. McCulloch for $2,460,000. Each block on the bridge was numbered, the bridge disassembled, shipped overseas through the Panama Canal to California, trucked to Arizona, and reconstructed for a total relocation and assembly cost of $5.1 million. The bridge was built over dry land on a peninsula. When the building was complete, a mile long channel was dredged, turning the west end of the peninsula into an island. Today, London Bridge is a tourist attraction. An “English village” has been built along the river underneath the bridge with walkways, shops, and restaurants. The Visitors Center conducts tours. 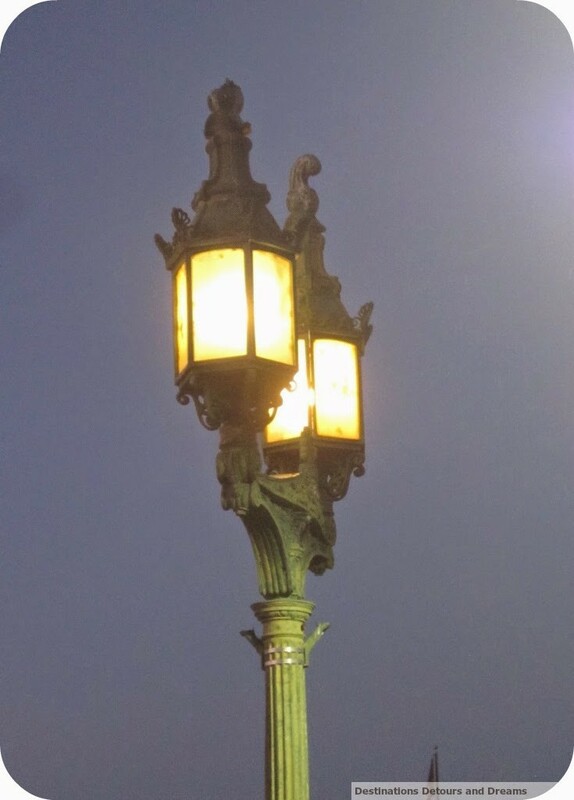 The original bridge lamp posts were part of the purchase. They were made from cannons that belonged to Napoleon Bonaparte. 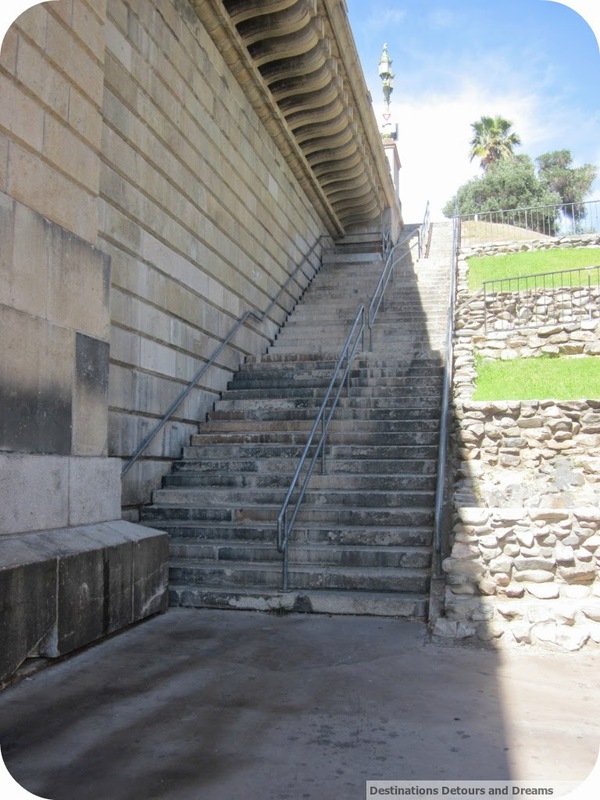 Stairs leading to top of bridge. As I was descending, I heard a young boy say to his mother, “52 steps”. I didn’t double-check his math. 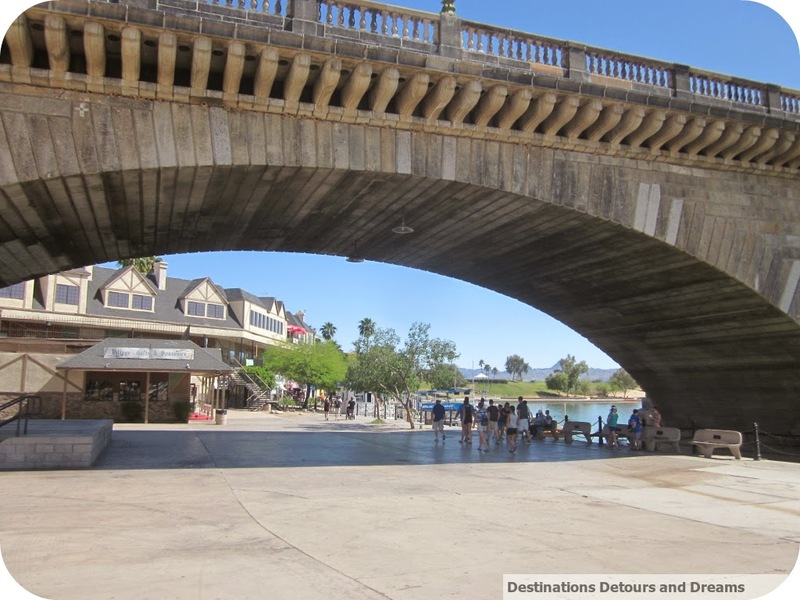 The entire idea of London Bridge in Lake Havasu City and the fake village built under it may strike you as contrived and touristy. And, to some degree, it is that, but it is also fun and interesting. The scenery is beautiful. There are several spots to sit and enjoy the it. Lake Havasu City is a new city, incorporated in 1978. The old bricks of London Bridge make a nice, timeless contrast to that newness. 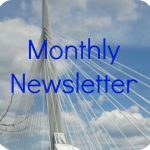 I visited mid-April and the place felt relaxed. 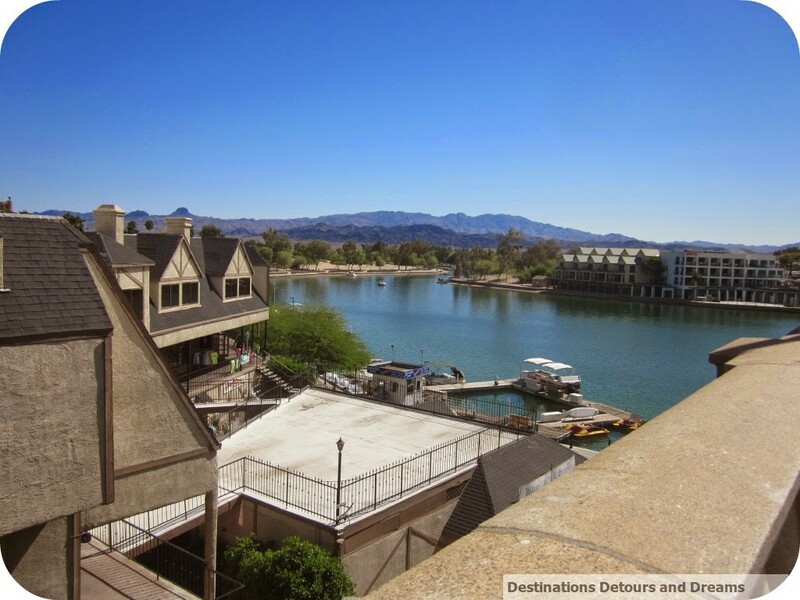 Lake Havasu City is a popular college spring break vacation spot. If you visit during March spring break, it may not feel so relaxed. And if you are wondering what happened in London, England, after the bridge was moved, a new bridge of concrete and steel was built between 1968 and 1972. 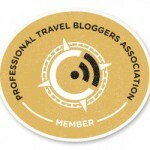 A link to this post appears in Noel Morata’s Travel Photo Discovery. 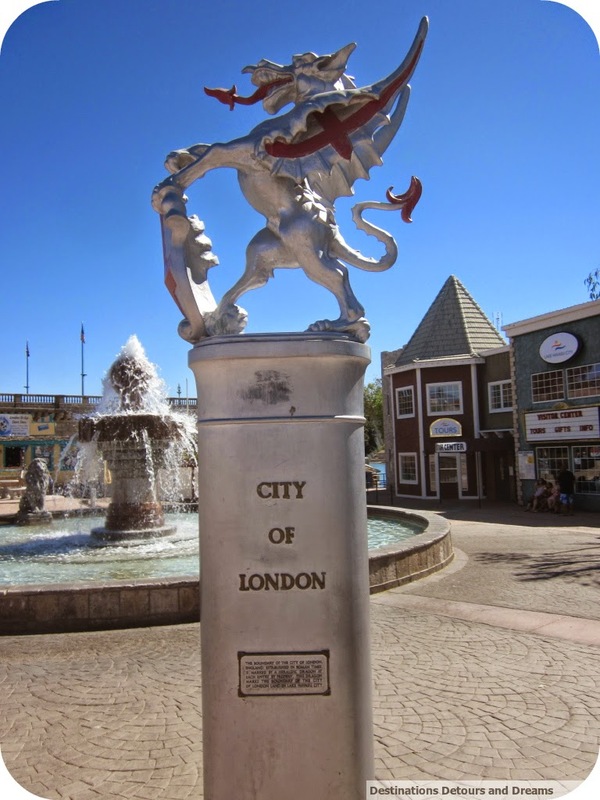 London bridge in Arizon!! I got to learn so much through your post. Looks like a fabulous place to spend the time with family. I got to see it over the Thames the year it was placed on the market. Glad I got to see it in its natural habitat! I admit that the concept of buying this bridge and moving it to Arizona just strikes me as somewhat bizarre. It obviously wasn’t considered very “historically worthy” by the Brits or it would have been protected on their registry of historic places. Having said that, I might be tempted to check it out if I were traveling nearby. Very cool, Donna! 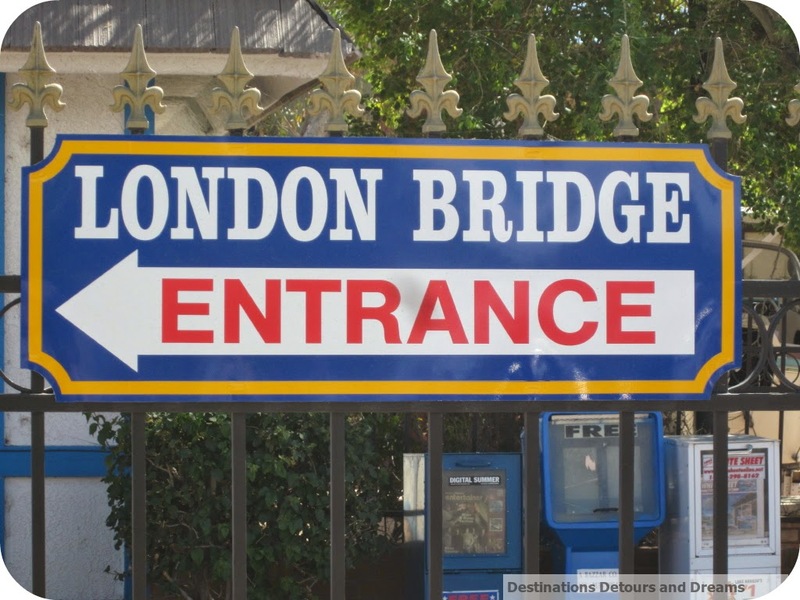 I hadn’t realized that they have other attractions from London along with the bridge! Sounds cute! 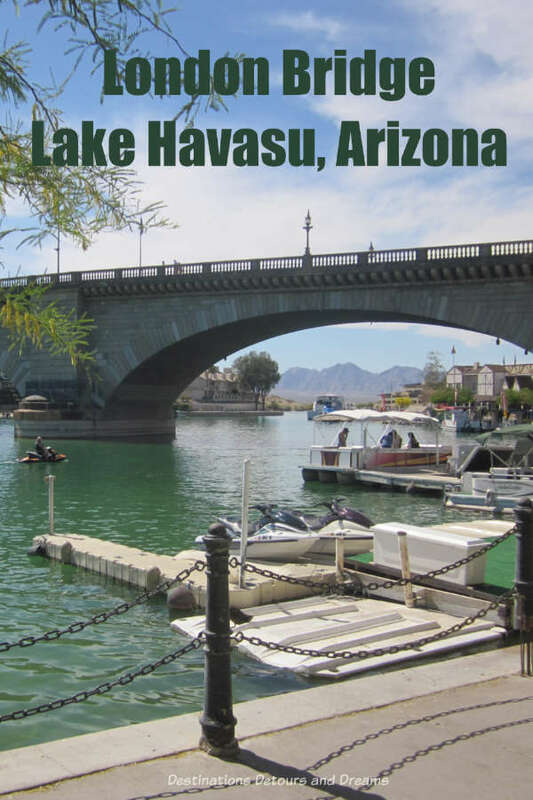 Have never been to Lake Havasu, but hope to visit sometime and meet up with all the Canadians there! We haven’t been to Lake Havasu and thanks for the showing some interesting sites. We met a couple from the area and they really love living there. 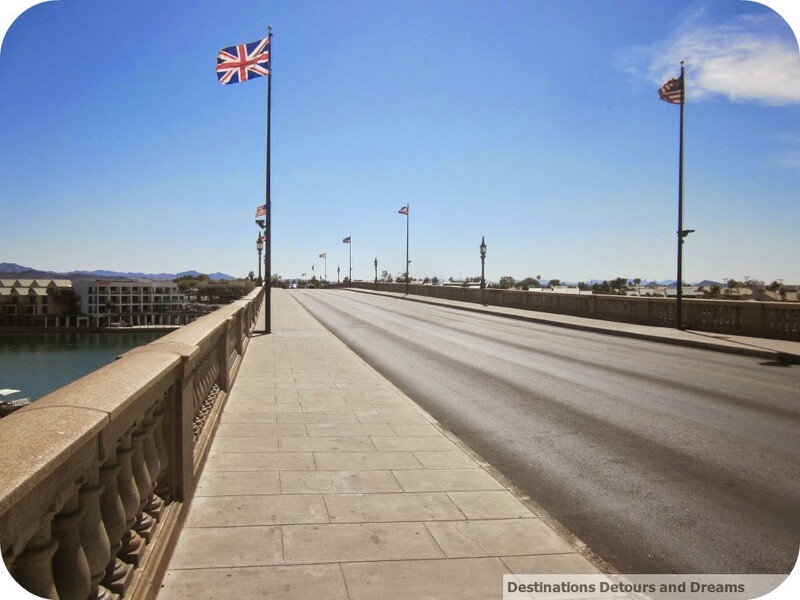 I had no idea there was a London Bridge in Arizona! 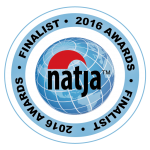 I love my faux European tours in Las Vegas so I’m sure I would like this as well! We visited this interesting site a couple of years ago. Who would have dreamed anyone could do something as crazy as this? 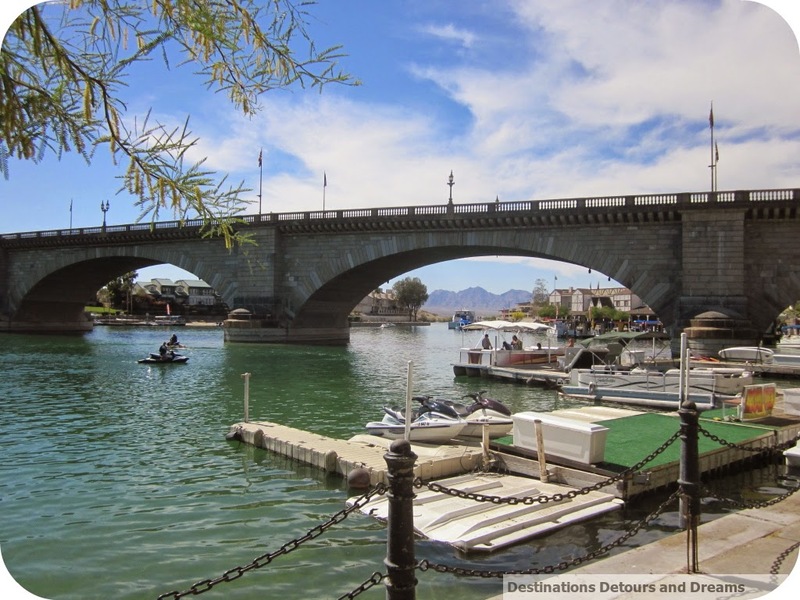 Lake Havasu is pretty touristy but the bridge is worth a visit. Great post! I have seen this years ago. Yes it is certainly touristy, however, so many people will never get to England. Why not give them a taste right here in the USA? 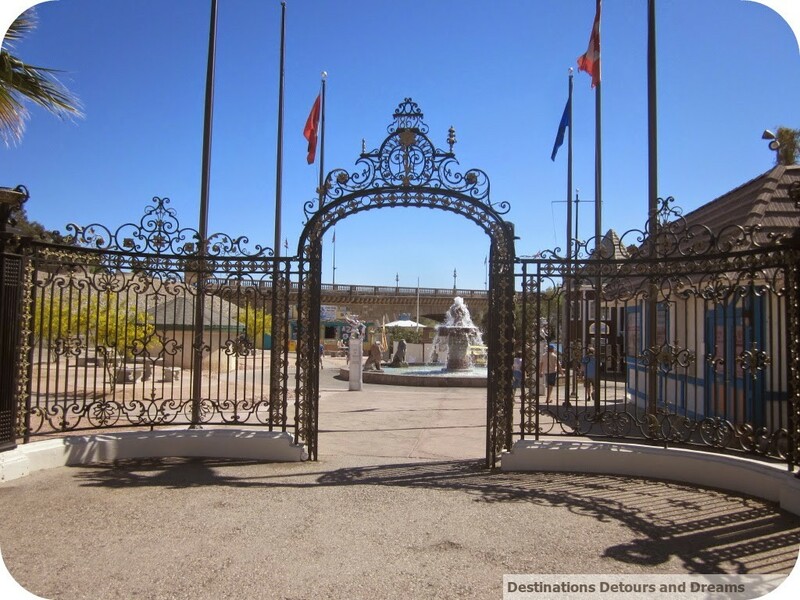 Like Michelle, I like the faux European landmarks in Las Vegas for the same reason! Who would have thought! It does look like an interesting place to spend an afternoon or day. 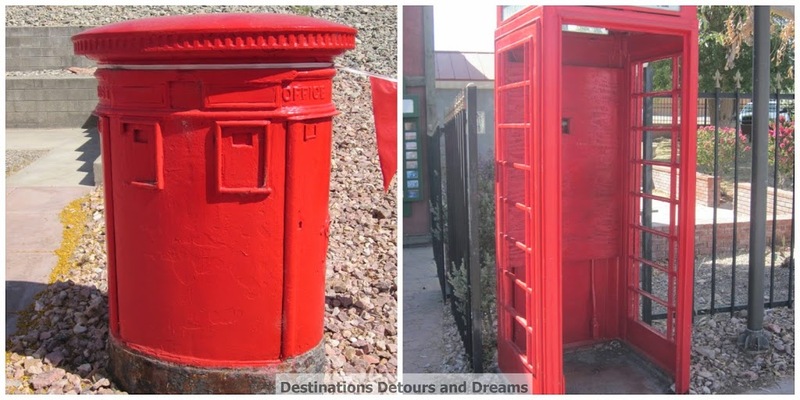 Can you send a postcard with a stamp from London? I don’t know if you can send a postcard with a stamp from London. It would be fun if you could, but I can’t imagine either the U.S. or U.K Post Office going for that. 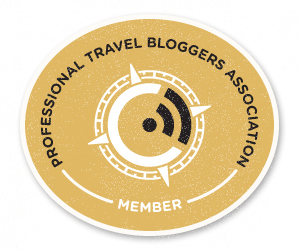 it sounds like a great destination and who cares if it’s touristy; fun is fun!! 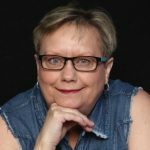 What a great story Donna. I never knew any of it, but certainly sang the song! It’s great to share the different pieces of history we come across. Thanks, i’m sure just about everyone can relate to this one. Oh Donna, what a great tale you’ve told us. I always laugh when I think of a bridge being sold to anywhere in dry, ol’ Arizona. You’ve made me think it might be worth a visit. Very interesting. I knew that London Bridge was somewhere in Arizona, but I didn’t know if it was on private property or open to the public. The story of them building it over a peninsula and the dredging a channel beneath it is not what I expected. I do like that you can actually walk under a section of it. I wonder if it has brought a lot of tourist dollars to the area. I bet it has.